AgEdNet.com ("we," "us," and "our") owns and operates the https://www.agednet.com website as a service of Stewart-Peterson, Inc. This Privacy Notice discloses the privacy practices for the AgEdNet.com website https://www.agednet.com and for information we gather from you over the phone, via conventional mail or in person. We take precautions to protect your information. When you submit information via the website, your information is protected both online and offline. Information collected on our website is encrypted and transmitted to us in a secure way using secure socket layer technology (SSL). You can verify this by looking for a lock icon in the address bar and looking for "https" at the beginning of the addresses of our webpages. What information we collect: We collect two types of information: 1) non-personally identifiable information that is routinely gathered as users navigate through a website and 2) personally identifiable information voluntarily supplied by you. Each time you visit a website, information is automatically gathered such as your IP address, domain name, browser type, the name of the page from which you entered the Website, which pages you view, and for how long you view them. This information is collected in order to improve the website and to analyze how our site is used. 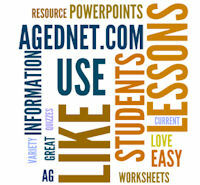 We will use information such as your name, email and school contact information to provide and manage your subscription to AgEdNet.com and to respond to your contacts. We will not share your information with any third party outside of our organization, other than as necessary to fulfill your request, e.g. to send an eUpdate you have requested, to answer a question or to complete a subscription request. We are the sole owners of the information collected on this site. We will not rent, sell or share this information with any outside organizations. AgEdNet.com will abide by all applicable laws governing the release of personal information. We use "cookies" on this site. A cookie is a piece of data stored on a site visitor's hard drive to help us improve your access to our site and to identify repeat visitors to our site. For instance, when we use a cookie to identify you, you would not have to log in a password more than once, thereby saving time while on our site. Usage of a cookie is in no way linked to any personally identifiable information on our site. We request information from you on our order form. To purchase a subscription, you must provide contact information, including your name and information about your school. This information is used for billing purposes and to set up your subscription. If we have trouble processing an order, we will use this information to contact you. From time-to-time our site requests information via surveys or contests. Participation in these surveys or contests is completely voluntary and you may choose whether or not to participate and therefore disclose this information. Information requested may include contact information (such as name and email address), and demographic information (school name and state). Contact information will be used to notify the winners and award prizes. Survey information will be used for purposes of monitoring or improving the use and satisfaction of this site. The AgEdNet.com website is hosted and operated in the United States and is subject to United States law. Any personal information that you provide to us is being provided to us in the United States. You consent to the transfer of your personal information to the United States in order to receive services from AgEdNet.com. If you are accessing a website from outside the United States, please be advised that United States law may not offer the same privacy protections as the law of your jurisdiction.